At SupraStore.com, we OWN and DRIVE Toyota Supras, and if there is one thing we know, that is what wheel looks good on a Supra! No matter what color Supra you drive, we know what looks great. 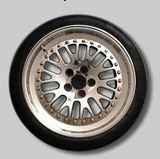 Choosing a wheel is a very difficult proposition, as you want the best looking unique wheel for your car. When you spend $2500+ for a set of wheels, you don't want to make a mistake with people that don't know Supra's like we do. Let our experts help you select a wheel for you budget, taste and goals with the car in mind. We carry all the hottest brands, plus every major Japanese brand and also custom fit wheels such as CCR, HRE and Fikse. We know what offsets work on the car, what tires sizes are optimal and can interpret your desires and make your wheel selection a simple process. Email or call us at our mega-store 800-717-3050 and let's put our minds together to find you a set of wheels that you will enjoy for years to come. Titan Motorsports TMS Wheel Spacer for 5x114.3 Toyota Supra Lexus Etc.